The Castelli Men's Podio Doppio Jersey was specifically designed for long, intense training rides for Castelli's pro riders on Team Sky. Featuring a new cut with Castelli's Prosecco GT fabric, the Podio Doppio fits right, stays dry, and looks good. A full-length YKK® Vislon® zipper has a Scorpion zipper pull and an overlap collar to protect the neck and make ventilation adjustments quick and easy. A drop tail design offers just a little bit of extra coverage, while the inset sleeves sit snugly and at a slightly longer than average length. Lightweight, breathable, versatile training jersey with a full-length zipper. Prosecco GT main body fabric offers exceptional moisture wicking for all-day comfort. Full-length YKK Vislon zipper with overlapping collar for neck protection. Claimed weight: 142 grams (size Large). This is my second castelli jersey and i am super please with it . On my Sunday rides, I wear it and it feels great. I always turn to my Castelli jerseys when I know it's going to be a hot day but am always apprehensive about purchasing them because of the size challenges. I'm consistently a men's L in every other brand, but my Castelli jerseys are all either XL or 2XL depending on the line's cut. I'm 6'1 and currently 188 (not an athletic build) and have this jersey in a 2XL that fits very comfortably for day-long rides...appropriately snug and fitted without being compression-tight, with no extra fabric flapping in the wind. Form fitting Jersey that performs at a higher level. I needed a Jersey for upcoming sportive and I been wearing Castelli since 2015. These jerseys are the best for my riding need. I am 5 11 155 lbs. and large fits me perfectly. I use the jersey for my summer commuting and training, usually one in the same. I prefer the longer sleeves the jersey has and the fabric is soft and evaporates sweat very effectively. I wasn't too sure about the tail of the jersey when I first got it, but it seems to do a good job of staying put and provides a little easier reach into the back pockets. Liked it so much I bought another. A snug fitting jersey that has great wicking and comfort. 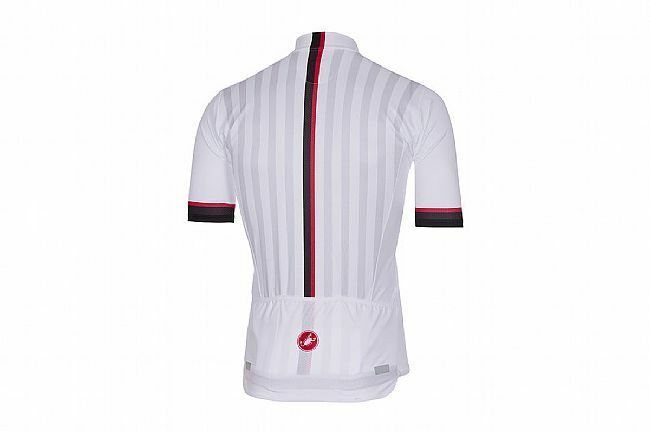 A great warm weather cycling jersey. I use this jersey in my Spinning class that I instruct. Not sure if it would work well in cold weather.